Exclusive DJ Expo subscription offer! 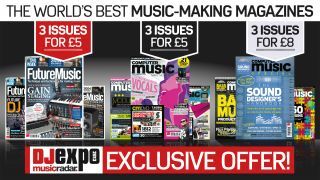 DJ Expo 2013: To celebrate the two day online show that covers all things DJ related, we wanted to offer all visitors of MusicRadar's DJ Expo 2013 a special subscription offer for print editions of Computer Music, Future Music and Computer Music Special. In addition to watching video demos of the latest gear, expert seminars and tutorials, plus a host of artist features with world renowned DJs during the Expo, we wanted to give you the chance to subscribe to your favourite magazines. You'll only be able to take advantage of these offers during MusicRadar's DJ Expo, so make sure you subscribe now while the DJ Expo is still running and these offers are available. Get three issues for £5, and then pay £28.49 every six months thereafter (that's a 30 per cent discount off the cover price), when you subscribe to Computer Music, the complete guide to making music with a computer. Each month you will find easy to follow tutorials for all sorts of music software, unbiased reviews of the latest products and answers to technical questions. Get three issues for £5, and then pay £28.49 every six months thereafter (that's a 30 per cent discount off the cover price), when you subscribe to Future Music, the magazine that delivers the technique and technology behind the hits. Packed with inspiration for today's modern musician there's reviews of hot new gear, tons of tutorials to help you get the most out of your hardware and software, and exclusive In The Studio features where the stars take apart their tracks. Get three issues for £8, and then pay £15.49 every six months thereafter (that's a 20 per cent discount off the cover price), when you subscribe to Computer Music Special, the bi-monthly spin-off of Computer Music magazine. Click here to check out an example. Each issue focuses in depth on a particular topic or a popular music production software package, with step by step tutorials, advice and software.